Once again demonstrating its seemingly inexhaustible supply of oddball concepts, innovative efforts and games with peculiar premises that appeal to the mainstream as much as they do to Joe Gamer, Nintendo has something new to show. "Flash Focus" isn't a new concept. "WarioWare" let Nintendo show the world that mindless mini-games could hold up a title of their own. Then along came "Brain Age" and its little brother, "Big Brain Academy." Game developers and fans raised on a steady diet of fantasy themes were shocked to discover it was fun fiddling with short, learning-focused brainteasers. It turned out you didn't need a Valkyrie in a metal bustier with a laser sword to make a video game entertaining. Logic puzzles and memory challenges were enough to drive a simple title to the top of the sales charts. Promising to energize your eyes, "Flash Focus" takes the mini-game model and shines the spotlight on things you look at. Following the "Brain Age" formula, "FF" presents a chain of short challenges that require you to stare, compare and be aware of things flashing on the screen. Watch a set of numbers blink on the screen, and then see how many left an impression on your memory. Try to follow a bouncing symbol across the screen, or test your eye-hand coordination in a series of sports-themed games that put you on the football field, the soccer pitch and more. With a stream of skill-training games flowing to the market, you might get the idea that Nintendo is simply milking the trend by pumping out cheap-to-produce mini-game collections. But a quick visit overseas will show you that the Japanese market is swimming in edutainment and outright learning titles. It's not uncommon on a Tokyo subway to see a businessman engrossed in his DS, buffing his vocabulary, learning to cook or even just brushing up on his common sense. Similarly, "Flash Focus" wants to reach outside the usual game market. If Nintendo can get seniors rolling with "Wii Bowling," then why not try to tap into the graying generation of "Minesweeper" and "Solitaire" players and turn them into proper game fans? Once you get people to play learning games, it's only a matter of time before they seek out more complex entertainment. If timing swings to bat a sinker in "Flash Focus" really helps improve your visual skills, then gunning down hordes of aliens in "Halo" or tossing the long bomb in "Madden" seems like the natural next step. Selling people learning as fun, and casual entertainment as self-development, Nintendo gets back to a fundamental notion shared by all gamers - playing games is good for your soul. Who's It For: While gamers will enjoy the novelty of a daily visual-skills training game, "Flash Focus" is really for the casual player looking for something interesting to try. If You Like This, Try That: "Brain Age" and "Big Brain Academy" still rule in the English-speaking world as the best of brain-improvement titles for the DS. Smart, funny and strangely entertaining, these mini-games make it almost believable that playing them daily could expand your gray matter. 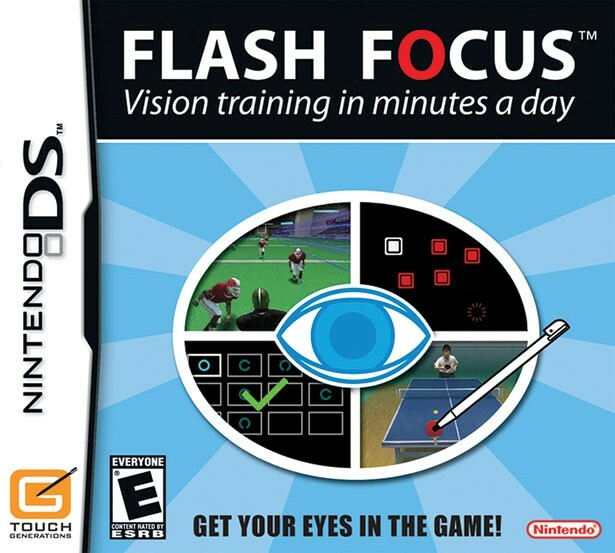 Best Part: Whether the science comes through or not, "Flash Focus" can claim that it is based on the work of Hisao Ishigaki - a professor who researches vision enhancements for professional athletes.